To be sure this is not the first time that I have done a blog about organising things under the kitchen sink cabinet. 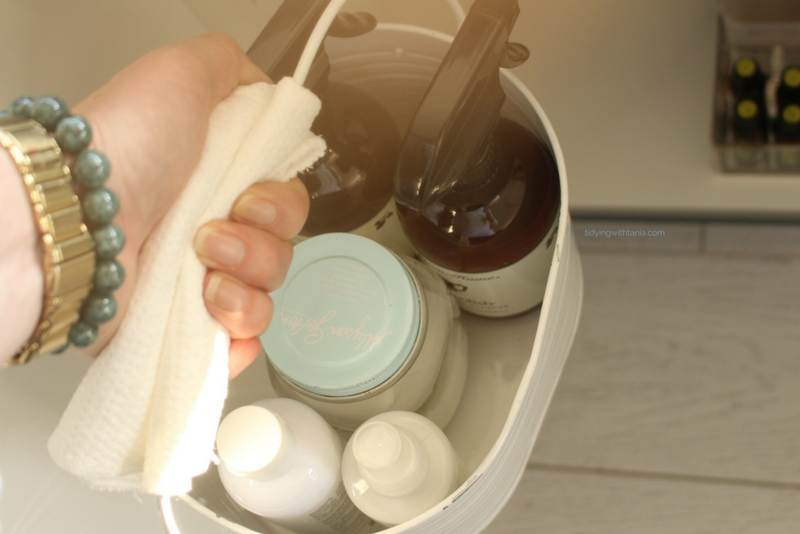 My previous post Taming the mess under the sink takes you through how I had things organised in our old kitchen and the process I went through to get things sorted. Now that I have a new kitchen it's time to review this cabinet space again and get it working even better. When we moved back into the kitchen I just put things back into the kitchen sink cabinet in the pretty much the same way that we had it in the old kitchen, and I didn't really think that I would need to make any changes. However I have found that we started using things differently and some things I just didn't use anymore. One of the biggest changes is that I now have two shelves and where as in the old kitchen I had just the bottom shelf in the cabinet. I also had to use the sides of the doors to place things, like washing up gloves, brushes, plugs etc. In the new kitchen under sink cabinet the second shelf has turned out to be a great place to store those items I had on the side doors. The one thing that I found was not working as well was how I organised my kitchen cleaning products. I use a mix of my own home cleaners plus new products that I have received with my new kitchen, such as stainless steel cleaner and stonebenchtop cleaner. I had these stored in different places in the cabinet and it was a bit of a pain not to have them in one place. I also managed to collect a lot of nice new tea towels and could no longer keep all of them in the original container, plus I have a some drying mats that I now use on the side of the sink. There were a few containers that I had kitchen cleaning items in, that I found I just was not using any longer. Lastly I was getting frustrated with my storage of my essential oils, it was not ideal and I really wanted to get them into one storage container. Somewhere to put the gloves, brushes, plugs etc. It just so happened that Pete and I checked out some hospice shops recently and I came upon some great storage finds that were perfect for the under sink kitchen cabinet; a tin caddy , glass jewellery container and small bowl. The tin container is perfect for the kitchen cleaners and even has a handle on it which is perfect so I can just take the whole thing out when doing the cleaning. Best of all I was able to corral all my kitchen cleaners into the one container. The small bowl turned out to be just the right size to hold the sponges and plugs and it sits within the original container so I can have the gloves and bowl altogether. But I've kept the best to last, the glass jewellery box for $3 turned out to be the perfect essential oils container. The lid was broken which was fine by me as I didn't need it anyway. I put in all my essential oils which are easy to see and I can also hold the other bits and bobs that I use with my oils. I have to say I am so happy with this find. For the rest of the containers I just used what I already had and found some unused glass jars for the dish tabs and the Steelo. If you don't have any existing containers and need to purchase them here are my best picks, from Amazon for my Northern hemisphere readers and Kmart for us Kiwi and Aussie readers. I have tried to find similar products to those that I have used. When working through organising a space, it is really important to make it really functional, If it's not functional then it will not be long until the space gets messy again. The first step in the organising process, for me, is to take everything out and map out how I think the space can work well. Thinking about the things I use and how I use them, how I will store them. This process really helps me to decide the best layout. So after a bit of fiddling around I struck upon the new and perfect (may I just say) layout. The top shelf was best to hold those items that you reach for often, like dishcloths, gloves, scrubbers etc. In the middle, under the sink I put the everyday sink items, rubber glovers and sponge bowl, then the dishcloths one side and the cleaning cloths on the other. On the bottom shelf, at the back I have the plant food as I only need to access these once a month. In the front I have the kitchen cleaners all corralled in the tin container. In the middle is all my essential oils and on the other side are my jars with the dish tabs, steelo and disposable gloves. I have moved all the tea towels to the linen cupboard and they have their own, bigger, storage basket. You will see this when I get to do my Linen closet reorganisation. 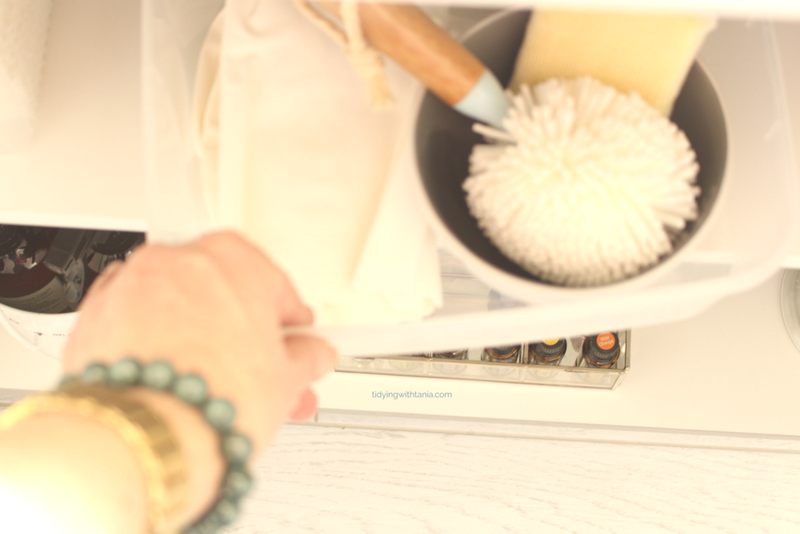 I have not changed my above sink storage , as per my previous post, however I will be making changes on this soon and will reveal that when I do a full review of my overall kitchen organisation. I am really happy with how I have gotten everything organised this time and did manage to tick everything off my wish list. So how is your under sink cabinet? Need a good clean out? Need motivation or help? Just drop me a line as I am happy to chat about best options. or just share your great ideas. 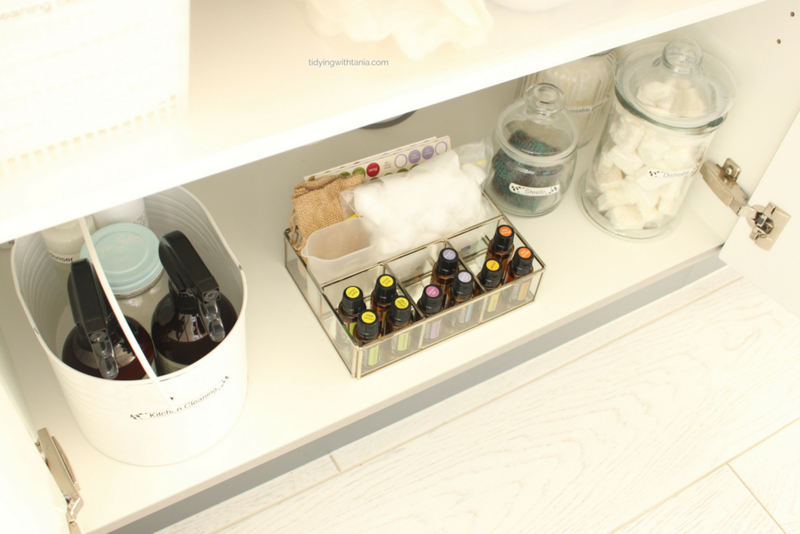 Want to see more kitchen organisation and other home organisation? Stay tuned by signing up below, to my newsletter where I share even more great ideas and content.